Did you ever think about putting several TVs/monitors to the wall and show there some dashboards? Current status, some pie charts and trends, alerts or advertisements. 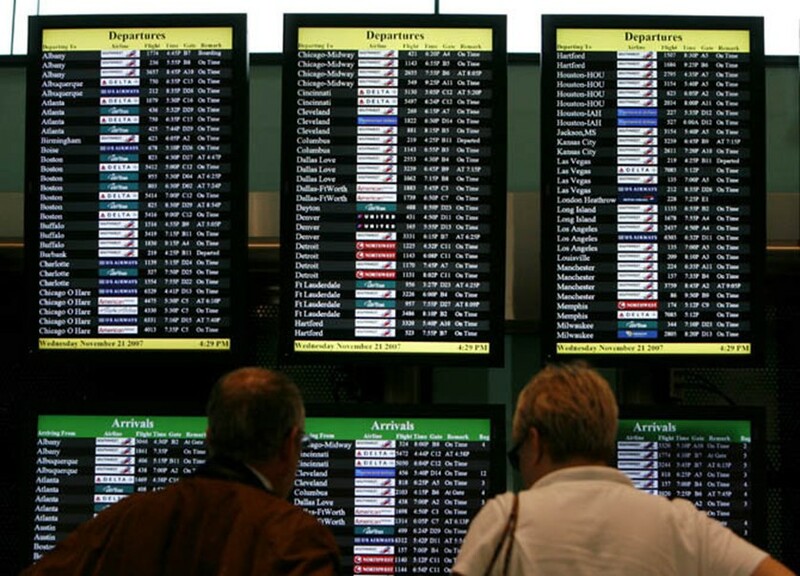 Or much like an arrival/departure tables in airport? So, how would you do it? “Ok, we would need some apps to show the information and most probably the is a portal will all that available, so simply launch several Chrome instances in full screen mode and that’s it“. But if you are reading this blog post probably you’ve already realized that isn’t really so simple. Second, you want them on certain monitors. A good start for the solution is given by the Stack Overflow answer. As we need to be able to modify easily the apps, URL and entire solution easily, I’ve decided to create a script on PowerShell. But helper functions wrapping WinApi are put into a .NET dll. Run PowerShell as Administrator and execute the following, confirm when prompted. Write-Output "starting chrome $Url , monitor: $MonitorNum"
We moved it into a function to easy start several instances. First we start a chrome instance with some command line parameters, an easy part. And look for that window handle, based on the above described criteria. Once window handle is know you are the master of it. And send F11 key to it. # if Window not moved (especially on machine start) - try increaing the delay. The first command is optional and commented, but could be useful when somebody played with your kiosk and you want quickly to restore everything back by a single click. And put it into your Startup folder. You may download already compiled solution with sample script. Download link is at the bottom. You may put into another folder – but ensure you renamed path in all places. Double click on link (Start – Kios – modifypath.lnk) to ensure browsers are started and opened on necessary displays. If window is not moved to another desktop – try increasing the delay in script ($ChromeStartDelay) variable. Script has been tested on Windows 8.1 machine. This solution is the missing link in a multi-screen project I’m looking at. However, I can’t get it to work (Windows 7), after doing the necessary adjustments for paths, URLs and monitor disposition, when running, it stumbles at the dll call with “Add-Type : Could not load file or assembly ‘file:///C:\kiosk-mode\Tomin.Tools.KioskMode.dll’ or one of its dependencies. This assembly is built by a runtime newer than the currently loaded runtime and cannot be loaded.”. Is the solution in fact only Win 8.1? Is there an easy adaptation to Win 7? Another Idea – Powershell is running on old .NET. OK – that’s got it working. Many thanks, nice solution! Assume there’s not a way to get “true” Kiosk mode (rather than Full Screen)? I guess not, as that requires starting Chrome with a switch in the command line, rather than sending a key sequence. It is possible to specify command line switches in my solution. Variable $chromeArguments in the script. But the problem is – we cannot move FullScreen window. That’s why I start it normally move to the necessary Display, and then turn full screen by sending a keystroke. Chrome has command line argument for window position and fullscreen (or kiosk mode), but they don’t work together. In fact, it is possible to move even fullscreen window, but it is much more complicated. Thank you for this! I managed to combine your C# into the powershell script so I go the entire thing in one file I can just execute from command line. No DLLs to compile and copy to the right place. Basically involves putting all the C# code in as a string and then using Add-Type to compile it. I’ll send if you are interested. Can you please post the script here? I know several years has passed but I’d also be interested in this please Garr G.
@Bram, you’re right, I noticed the unblock button under properties. I find this button using Win 8.1 but not in win7. Where is the dll file. It does not show in the file list. But the problem is, the second browser is not moving at the second monitor. Can you help me on this sir? Your help will greatly appreciated. Hi, I’m glad you find it useful. I started my journey with Chrome “–kiosk” switch. But I didn’t find a way to move a window in that mode. Though it wasn’t strongly necessary for my purposes, full screen was enough. I can’t find the .dll file. It does not show in the list. Do I need to generate it?? Tomin Oleksandr Congratulations, your work is amazing !! But I doubt has arisen, we need the status bar is hidden chrome and do not know how. We thought about using Firefox (if you can hide the bar) but we are not able to release it. Could you guide? Hello again. First, sorry for my English. I put a trap to explain what is the bar to which I refer. In Firefox you can hide, but you can only Chrome hide the –kiosk mode. That is why we would like to use Firefox instead of Chrome. On Windows 10 the Chrome windows do not get moved to the designated monitors. All instances open without error, but they don’t get moved. Any idea on what the issue might be ? It opens the n.1 link on the n.1 display. Then it goes full screen BUT when it opens the second window upon the primary, it goes also full screen but it leaves a ghost image on the primary window. I think it’s like a refresh issue because if I click on the primary window, the ghost image disappears. Maybe sending the full screen mode to the secondary window first? Thanks for your good work, I tried it on and W8.1 & W10, works perfectly. I wanted to ask if there is the possibility to set the resolution of the various monitors; would import for viewing photos. Thank you for sharing this. A life-saver. On Windows 10 is there a issue? I have a slightly different use case where I’m using 4 separate chrome windows over two displays and having them tiled vertically, 2 up on each monitor. and then using the “objShell.TileVertically” vbscript command to run the two windows side-by-side. But now I want to add a monitor and a further two chrome apps and having great difficulty ensuring the apps open on the appropriate monitors. I came across your powershell script which looks like it would work but yours is designed to push each to a monitor and full screen where I’m looking to tile them. Also, you work with the Chrome window where I need them to be apps to make better use of the screen real estate. Do you think your script could be manipulated to work with chrome apps instead?